Silverstyle: Layering Over or Under? What would Cyndi Lauper say? Yesterday a good friend came into town for a short visit. I love when he shows up. That always means I'll be inspired to try a new restaurant or event in my own area. Today we went to a Mediterranean restaurant for lunch and stopped by our local performing arts center for a Photography exhibit called It's Only Rock and Roll, But I Like It. By Janet Macoska & Anastasia Pantisios. Even though my giddy up isn't yet up to full speed I walked around for a bit and took in the sights. I took some photos for the Man and thought this one of Cyndi with her perplexed look fit my post perfectly. Today it was 0 degrees when I got up. The thought of voluntarily venturing out wasn't a pleasant one. I decided to really bundle up. In the first picture I have on tights, fleece lined leggings and a light, weight, turtleneck, sweater under my dress. After I got home I took some photos to try to inspire me to blog and I noticed something was terribly wrong. And I mean YIKES wrong. I don't have a huge weight issue. As most of us I could stand to drop a few pounds but with me it varies on a daily basis (true). Most of these unloved lbs reside on my thighs and occasional tummy bloating. Between my tummy and the tightness of the tights and the bulkiness of the turtle neck I look like a plump little sausage. So that got me thinking. Am I built to layer under? Or with my body type should I stick with the layer over? This really is starting to sound like the title of a Seinfeld episode! 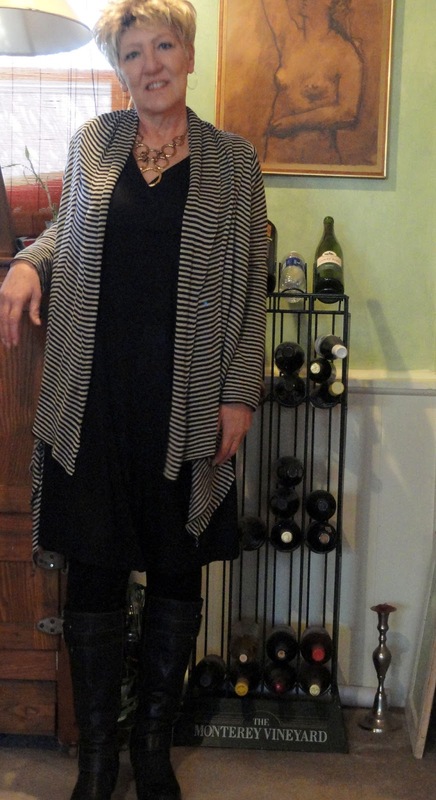 The next photo shows me without the to-tight-tights and the turtle neck has been removed and replaced by a stripped cardigan. Even with the horizontal stripes I look slimmer and less bulky in the middle. This seems to be an issue many of us face as we age. So really taking a hard look is worth the time and effort. I don't have the best of full length mirrors which I hope to resolve soon but I did look both front and back and simply did not see the extra bulk until I took the photo. I think that mirror issue needs to be dealt with sooner than later!! So what are you? Layer under or over? On a personal note........... Yesterday the doctor released me to return to work. It was also 5 months to the day since I took my failed flying lesson up the stairs. I am both happy and terrified all at the same time. My job is very fast paced and the computer system has changed since I've been off. I've been working with the new system from home but there is only so much I can do on my own. So wish me luck and send a blog prayer my way I have a feeling I'll need it! All clothing thrifted under $10.00. Boots clearanced from Carson Pirie Scott last spring. Necklace in second photo available in my Silverstyle Shop. 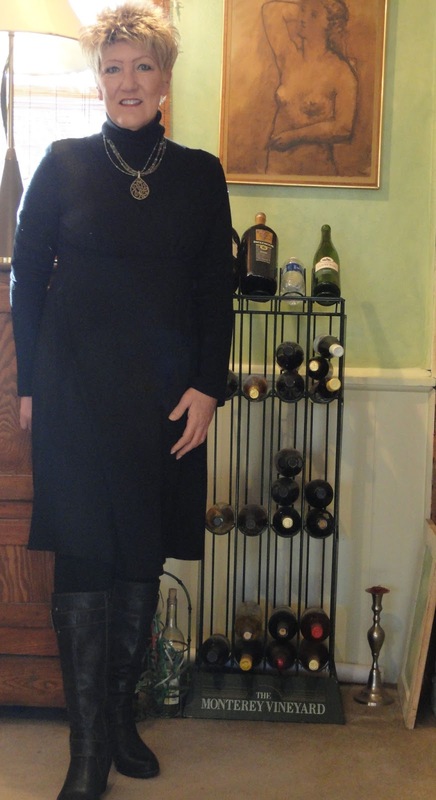 Linking up with Patti at Not Dead Yet Style. Tammi, first I wish you luck for your return to work tomorrow, though I'll bet you won't need it. You seem like a sharp cookie and I'm sure you'll pick up the new software in no time! I remember reading somewhere that you should always layer with the lightest and least bulky pieces underneath. So that's probably why your second look feels better to you. I think you look fine in both. :-) Great looking necklace too! Good luck heading back to work. You'll probably enjoy the adult contact after being at home so much. That's what I crave working from home. I do like the over layers best just because it adds more dimension to the outfit. But I also like the monotone of the top photo. I try to keep my layers thin underneath but like bulky chunky sweaters in cold weather like this. I'm going to go check out your shop! Good luck with the return to work! As for me, I layer under AND over, but in all but the most unbearably cold weather, I tend to go with very flimsy and slick underlayers, made of stuff like silk and nylon. Cold enough, and out comes the merino long underwear. I have more problem with too much bulk in the bust and shoulders; I can actually USE it in my hips and thighs. I think both your looks are great, but your own personal comfort level is something only you can dress for, you know? hi Tammy, I hope you found your brocade jacket! I try to layer with as little bulky items as possible...I know one day last week, I looked a little bloated from layers!! This is such a fun necklace...love it. Have fun at work and be extra careful on the slippery walkways!! Bloggy prayers coming your way ... but you'll be great, I know. Everyone will be so happy to see you! I'm a layer over person, because I have too big a rack for my height, and any extra bulk there looks so wrong! You look much less bulky than you think, actually. So be comfortable ... you have cute in the bag! Going back to work prayers going up for you!!! Definitely the layer over outfit--very cute!! I layer over because I get "power surges" and it's easier to strip off clothes!! You look lovely in both the photos, but your post has got me thinking. I'm a layer over person. I've tried the underlayers, and I just end up feeling frumpy. Good luck with your return to work. I just went back a few weeks ago after being off for 8 months. Yikes! It's a bit like riding a bicycle. You think you've forgotten something, and someone prompts you, and then you remember. My first day was that way, even with some upgrades to the computer system. Technology goes so fast it makes me crazy sometimes...so I can relate and im sending teckie goodness your way. I'm over and under lately. I packed poorly for SoCal, and so I've had to layer both to stay warm! Both look great BTW! Glorious as ever, my dear friend. I love your layers. Personally, a layer shirt + sweater is my favorite. I understand you need good wishes to go back to work. So good luck! I love me some Cindy lauper, I like the turtleneck because it shows off your cute hair cut:) have a grest weekend . I think you look fine in both photos, but the second one looks more "you". I wish you well on returning to work. Remember it will be hard at first because you haven't been used to the confinement a job presents. Don't be too hard on yourself. Every new computer system is hard at first and then a few months down the road you wonder why you thought it was so difficult! Been there, done that.